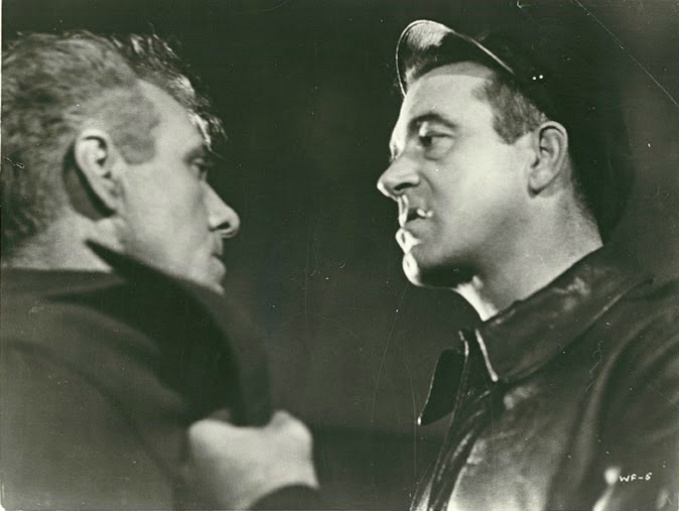 Payne stars as Eddie Driscoll, a man who never really recovered from losing the heavyweight championship. At night he drives a cab and during the day, he’s forced to listen to his ungrateful wife Pauline’s relentless nagging. She’s constantly bitching about how broke they are, how she never should’ve married a boxer. On the side she’s two-timing him with petty crook Victor (Brad Dexter of The Asphalt Jungle fame). Together they steal $50K worth of diamonds, but being unable to fence them, Victor murders Pauline and frames Eddie for it. Payne is great as the washed up fighter. He plays it with heaps of sorrow, with his damaged eye serving as a metaphor for Eddie’s inability to see what’s really going on around him. After Victor frames him, Eddie reacts the only way he knows how: by throwing punches with everything he’s got. His only allies are his boss at the cab company and Linda (Evelyn James), a woman obsessed with becoming a star on Broadway. Her acting skills come in handy a couple of times in the film – particularly during one brazenly racy scene in a bar. Karlson depicts NYC as one rancid cesspool of crime and opportunistic crooks. There is no daylight in the film. Much like in Kansas City Confidential, 99 River Street is shot in a very natural, quasi-documentary style. Unlike more of the expressionistic noir directors, Karlson just tells it like it is. And like in his previous film, Karlson here presents vigilantism and violence as the answer to everything. Someone trying to frame you for murder? Don’t go to the cops, punch someone in the face like 50 times instead. The climactic pursuit in a dock yard is a killer and displays Karlson’s knack for staging action. In the end, the film closes on a hopeful note. Everything wraps up a little too nicely for my taste, but it’s kinda nice to see Eddie smile for once. Fans of Kansas City Confidential will want to check this one out on Netflix before it’s yanked.